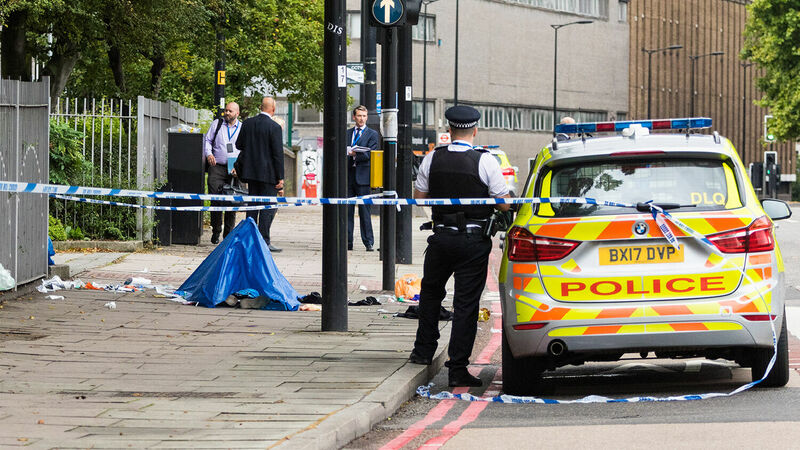 Detectives and uniformed police at the crime scene, following a stabbing in Camden, London, on Sept. 4, 2017. London surpassed its 2017 total for murders on November 12, when a man with a crossbow committed the city’s 122nd homicide of 2018. A 35-year-old pregnant mother died after a man fired a crossbow at her, striking her in the abdomen while her five children looked on. Her baby was delivered by Caesarean section and hospitalized in critical condition. In 2017, London saw 116 homicides. This year’s figure to date has now exceeded that total, and we will likely see more murders by the year’s end. February and March both saw 18 homicides, the second-highest number recorded for a single month since April 2010. Reports of death threats in the London area have also risen this decade by a massive 148 percent, according to Home Office data for London published by the Telegraph. Homicide rates since 2012 have risen by 45 percent, and grievous bodily harm by 67 percent. What is being done to stop this disturbing trend, and is it enough? There are, of course, many reasons this “disease” of murder continues to plague London. Some have blamed social-media disputes and police budget cuts. Although these all factor into the cause, they are not the foundational reason. Will increased funding or greater stop-and-search powers for police really stop the murders, or is there a deeper issue that needs to be addressed? Javid’s statement reveals a troubling problem at the heart of London’s soaring crime rates: Political correctness is crippling the exercise of justice. This indicates that police or their commanders are afraid to enforce the law in certain situations for fear of being called racist. Political correctness is forcing police to spend more time investigating hate crime allegations than catching criminals. This is a dangerous direction to travel. If this slack approach to detecting and apprehending criminals continues, then the murder rate will continue to rise. Britain’s broken families are at the core of why there are gangs in the first place. One major reason for gang activity is that these youths lack a stable family environment. Examine the surroundings in which gang members grow up, and you will see a culture of violence. Police often link the murderers to violent “drill music” videos posted online, where gangsters brag of the violence they commit. The lack of the knowledge of God produces an evil people. Verse 2 lists the sins of the nation. Our nations are full of lying, murder, stealing and adultery. We are living in perilous times—times in which “blood toucheth blood.” For this, the nations of Israel must be punished. Why? Because we should have known better. You can know better and escape this coming punishment. London truly does have a moral disease, but there are solutions which can solve these seemingly uncontrollable problems. Sadly, few choose to consider them, and fewer still do anything about them. What will you choose to do? To read more about these solutions, and how London’s murder problem will finally be eradicated, order your free copy of Hosea—Reaping the Whirlwind.